Eudyalite is a strikingly beautiful mineral of vivid reds and crimsons, born from the unlikely meeting of rare elements in rare circumstances. Read about this rare beauty and how it helps us to live our lives in the direction of our dreams. Eudyalite is a relatively rare silicate mineral, which forms in alkaline igneous rocks. Its name is derived from the Greek words “eu” and “dialytos”, meaning “well” and “decomposable” respectively – a reference to it readily dissolving in acid. Alternative names for eudialyte include eudalite, almandine spar and Dragon’s Blood. 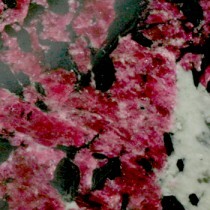 Eudialyte was first discovered and described in Greenland in 1819. It is also found in Norway, Madagascar, Arkansas in the USA and Mont Saint-Hilaire in Canada, but the most notable current source is the Kola Peninsula in Russia. Eudialyte rarely forms well-defined crystals and only occasionally forms any crystal faces at all. It usually occurs in granular form, embedded in the host rock (most commonly nepheline syenite). Crystals are translucent to transparent. The Kola Peninsula, where most eudyalite is currently found, is highly notable for its rich assortment of unique and unusual minerals. A series of igneous intrusions (volcanic lava flows) that occurred between 3 billion and 360 million years ago produced pegmatitic rocks known as agpaitic pegmatite – an uncommon mixture high in sodium and other alkali metals and low in silica and aluminum. These rocks form the matrix in which eudialyte usually occurs. In addition to these pegmatites are unusually high concentrations of traditionally scarce “rare earth” minerals such as barium, beryllium, cerium, niobium, strontium, thorium, titanium, yttrium and zirconium. The high concentration of these and other rare earth elements, in conjunction with the unusual agpaitic pegmatite is a very uncommon occurrence, and has resulted in a stunning array of extraordinary minerals, eudialyte being one of them. The chemical formula for eudialyte suggests that it is composed of Sodium, Calcium, Cerium, Iron, Manganese, Zirconium, Silicon, Hydrogen and Chlorine. But researchers from the University of Copenhagen and the Canadian Museum of Nature found as many as 46 elements, many of them rare, which can be present in eudialyte’s complex structure – sometimes in conjunction with each other, and sometimes replacing each other. Ranging in colour from violet-red to deep red, reddish brown, crimson and pink, specimens of eudialyte often form an attractive combination within a matrix of black, gray and white. Some specimens show hues of yellow or even green and blue. Eudialyte is sometimes used as a minor ore of zirconium (a metal that resembles titanium and used as a corrosive –resistant alloy). It is also highly prized as mineral specimens for collectors and an ornamental gemstone, because of its attractive colour. Connected to both the base and heart chakras, eudialyte helps to balance the emotional and physical bodies – it harmonizes the instinctual drive to survive with the urge to fulfil the heart’s desires. It helps us to choose the path in life that leads to our true fulfilment. Eudialyte can help to engineer situations in our lives that ensure we get on all right in the physical world, yet satisfy our emotional selves. It helps us move in the direction of our dreams. Emotionally, eudialyte is grounding. It helps us to overcome self-doubt, depression and fear and to take action. It helps us to abandon negative notions about our selves, as well as those about others. Spiritually, it opens our hearts to live our lives true to ourselves. It is said to stimulate the energy of higher love. Eudialyte can be used to fine-tune clairaudient capabilities and initiate extra sensory perception (ESP). It increases both Alpha and Beta states of the brain. The black inclusions found within eudialyte offer protection and neutralization of negative energies. Physically, eudialyte helps to calm the nerves. It is said to help with disorders of the nervous system such as Parkinson’s Disease, Multiple Sclerosis and even Alzheimer’s Disease. It has a stabilizing effect on the critically ill, and can help ease the dying process. Eudialyte relates to the astrological sign of Virgo and vibrates to the number 3.